Stan Buscovich, California P.O.S.T. master, retired from the San Francisco Police Department Mounted Unit, four time Grand National Rodeo Champion (Professional Color Guard Competition) at the Cow Palace, taught the 8-hour class on November 12, 2006. 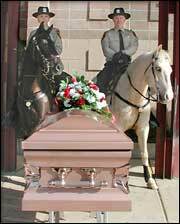 Mounted Units have clear advantages when covering large areas of difficult terrain from a high vantage point. In addition, they have unique strength for crowd control and public relations. 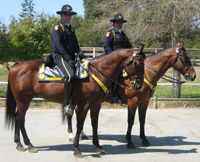 Such public relations functions include parades and funerals and are performed in uniform by the San Mateo County Sheriff's Office Mounted Search & Rescue unit. Morning session: 4-hour multi-media presentation on history of mounted color and honor guards, mounted formation riding and origin, explanation of military and ceremonial gear and symbolism. Afternoon session: Second half of the 8-hour class was mounted. Focus was on mounted formation riding, correct protocol and handling of the flags.